features a dude in an orange version of the hats we wore in high school marching band. So I seriously debated whether or not I should even bother reading it, much less review it. But, geez, look at some of the talent listed on the cover: Evan Dorkin, Sarah Dyer, Michael Allred, Philip Bond... Not to mention other folks NOT listed on the cover: Matthew Loux, Chris Eliopoulos, Frank Pittarese, Dave McCaig... I mean, when your name-dropping PRECLUDES guys like these, there MUST be something worth looking at there! As I said, I don't know much about the show this is based on, but I am familiar with the general themes of this type of children's programming. So the weird creatures and sometimes surreal moments I was able to take in stride pretty easily. 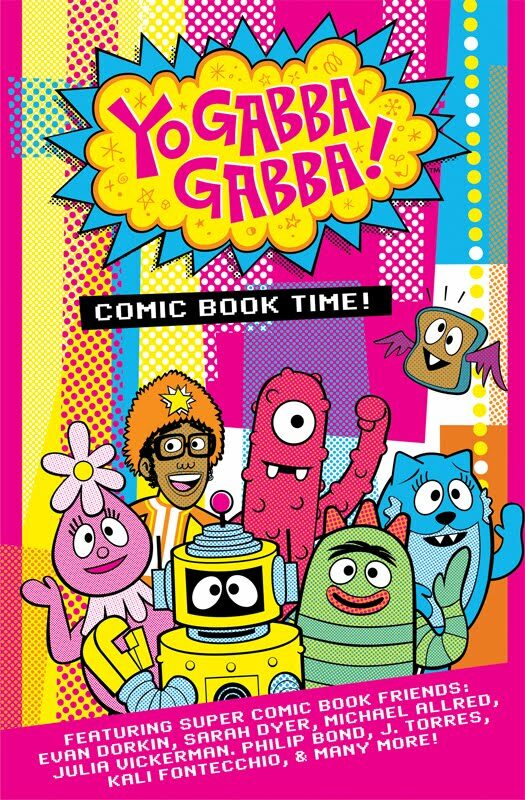 From what I was able to discern about the concept, there's this dude named DJ Lance Rock and he has this playset type of thing called Gabbaland where all these weird creatures hang out. It almost has a Mr Roger's Neighborhood thing going with the Land of Make Believe, only Lance can interact more directly with the others, and he's not quite so stogy. There's lots of happy dancing and singing in Gabbaland, and they take nearly every opportunity to learn or teach basic life skills like "practicing", "inspiration" and "sharing." 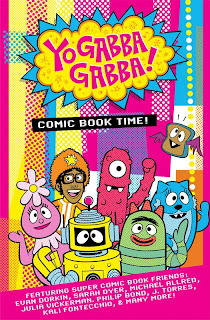 The book is basically an anthology of short Gabba stories. They're all over the map with regards to style and pacing and whatnot but, fortunately for me the reviewer, they're all by talented folks, so I can simply say that they're all good. The biggest difference among them is essentially style. That said, I think Julia Vickerman's piece is the one that does the best job of visually explaining the relationship between Lance and the Gabbalanders. While I really liked what Allred did, and it really took masterful advantage of the comic book medium -- especially after gaining an understanding of the set-up, leading with that piece left me... I won't say confused exactly, but I certainly didn't have an understanding how that relationship worked. Had Vickerman's piece been the lead, it would've made more sense from a newbie's perspective. I was able to figure things out somewhat retroactively, but it would have been nice to see how that world worked earlier in the book. The stories, overall, are generally pretty simple like one might expect from a kids' television show. As such, it's probably not for most of readers of this site. That is, unless you have young kids who enjoy Yo Gabba Gabba or that type of show. They will undoubtedly appreciate Comic Book Time and you'll have the pleasure of seeing some particularly talented folks at work entertaining your children.